Board a comfortable coach at your Buenos Aires hotel and head out into the Argentine pampas (plains). Attend a friendly welcome reception upon arrival at Estancia Don Silvano that includes juice, wine and traditional empanadas. Visit the ranch's bakery and its museum before attending a milking demonstration. Help the gauchos milk the cows yourself if you like, then watch as they saddle up the horses. Climb on a tame horse and enjoy a relaxed ride through the surrounding countryside. After the ride, eat a barbecue lunch including chicken, ribs, sausages, potato salad and ice cream for dessert. Watch a traditional Argentinian folkloric show including singing and dancing while you enjoy your beverages, including wine, soft drinks, coffee and water. Get on your feet and try out some of the dances yourself before opting for a carriage or tractor ride to view other parts of ranch. Watch the gauchos participate in ring racing and other demonstrations of their incredible horsemanship. Have a snack of quince jelly on sweet cakes before boarding your bus back to the city.Try mate, a traditional Argentine drink made of yerba mate leaves steeped in hot water that has its own rituals and history. 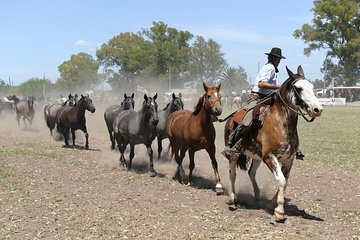 Your full-day estancia (ranch) excursion on the pampas ends with drop-off in downtown Buenos Aires. I guess i booked this trip not knowing what to expect. It was an overall great experience. We ranch was gorgeous and had tons of animals (i.e. sheep, pigs, horses, peacocks, chickens, etc). They had a mini rope obstacle course which ended with a zip line. The food and entertainment was amazing. I would highly recommend this trip for anyone. A soul destroying experience!!! This was not a trip to anything resembling a gaucho ranch. It was a hotel with grounds, some chickens, peacocks and 20 or so horses. And the experience was commercial garbage for the most part. You arrive at the ranch and are given a ticket if you want to 'ride' the horses. For the next 2 1/2 hours there is nothing organised except for some mediocre empanadas and drinks and a 15 minute walk on horses that are so sedate we wondered if they might be drugged. The signs said trotting was forbidden, but they needn't have bothered as the poor creatures barely wanted to walk. The 'ride' is also just a ploy to take you around a route they have set up with cameras so they can try to flog you photos during lunch. The alternative to riding is a so called carriage ride, but I've never heard of a tractor pulling a cart around a field called that before. We did enjoy walking around and seeing the old farm equipment, which was clearly brought in purely for decor, and the chickens, but that is the sort of thing you might drive somewhere to spend 30 minutes walking around. There was a zip wire oh how gaucho! which I ended up going on from sheer boredom. Then it was time for lunch, which is in a barn and reminded us of school dinners. Forget choosing where you want to sit or getting a look at the grills. I'd like to think whoever runs the kitchen was on holiday, as we were served the most awful food and cheap cooking wine. Come on! We are in Argentina, how hard is it to rustle up a chorizo sausage that actually tastes of something and a bottle of wine that costs more than 50 pesos at end retail cost? For the first time in my life I actually had a piece of meat that was medium rare and yet somehow dry as old boots. Some evil genius going on there. The fact that the only smell coming from the kitchen was petrol should have been sufficiently warning though. We thought the entertainment might save the day and it started out well. The singer and dancers were fantastic and we enjoyed the local dances, but it then descended into a sing along for all the nationalities of tourists in attendance. If we want to sing along to Let It Be we'll go to a cheesy Beetles show at home. The best part of the lunch was us sneaking away an hour early on our own to go see the paddock with some of the younger horses they don't use for riding. Lovely natured animals and that part was peaceful and more one with nature. The one part of the day we genuinely enjoyed was the 30 minutes of the gaucho show right at the end. Very skilful riders and horses that actually responded. Not as good as a proper rodeo show, but good fun. In short, if you love nature, horses, good food and anything even remotely approaching an authentic experience, stay well clear. The ranch is a commercially run affair for tourists. It is well run and lots of activities to enjoy. About an hour from the city. Pick up and return to hotel. Very smart mini coach. Great driver and the tour guide was excellent. When you arrive the gauch/ranch guide greeted us and was very friendly. Empanadas and a welcome drink. Horse trek, ride in a cart. Some time to wander and view machinery, animals and small shop. Demonstration on the history of Meta herbal hot drink of Argentina, customs and preparation. The making of empanadas. A great lunch of BBQ meats and salads with beer, wine or sodas.  A folk singer plus tango and traditional folk dances. There followed a horsemanship demo by a couple of gauchos. All in all the tour was great. However, I was slightly disappointed that the riding experience consisted of a 10 minute ride around the perimeter of a field and not the riding experience I had expected from reading the advert. This is an enjoyable day with much more meat than we could possibly eat. The horseback riding was relaxing a a nice way to get an idea of the size of the farm and it prompts your imagination of the elements that a gaucho must work in. A real surprise were the beautiful chickens. Our guide was very helpful and made sure we had a good time and the van driver was excellent. The only thing that we would change would be to make the drop-off points the same as the pick-up points. If you are considering this tour make sure you know the drop-off location and are comfortable returning to your hotel or apartment from that location. Thanks to the great entertainment from the dancers, singer, gauchos, and restaurant team. An absolutely fantastic day!!... Don't miss it!! We are very disappointed as there is no cow milking as advertised on the tour description. In fact the tour guide said there were no cows on the farm whatsoever. I dont understand why they false advertise. I brought my two kids along because they wanted to milk a cow. There was no discount for the tour for kids aged 8, 10, we paid for the full price. Without the milking experience, I would have done something else for our precious time in BA on our last day for this kind of money for 3 people. In addition, the tour guide showed up 30 mins late. Knowing there is always traffic in a big city, they should have budgeted extra time for the pickup. It is not very professional not to call me or inform me about their tardiness in a timely manner. I was also surprised to be shuttled to a souvenir shop on the drive to the farm for them to peddle extra business. There was horse riding and carriage riding around the farm for about 15-20 mins each, not particularly interesting or scenic. There are a bunch of farm animals to see. The lunch w singing and dancing show was very touristic, the food was solid. But that shouldnt be your focus since for the money you could see better dance shows and eat much better steaks in the city. 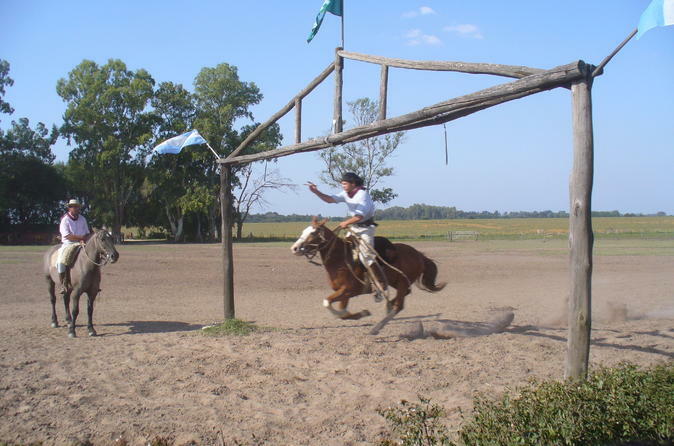 The last bit of horse riding demo by 2 gauchos is probably what you came to see. Honestly it is not that impressive. I have seen better ones in Hungary. For the money and time you would spend here, I know I know it is the word gaucho that catches your imagination, if you travel a lot, you would be wiser not to fall for the exotic words. If you want to do everything in one day and claim that you have done it like most Chinese tourists on a rush schedule, book the tour. Awesome Trip. Great food! Good wine! Loved the guide. Gave us so much information on Argentina, the nation and the area! Such a charming place. Beautiful grounds. Interesting antiques and authentic buildings. The people and activities were super. Santiago, our host and expert on many topics was completely enchanting. Worth every penny!! !